This second installment of Halloween nail art design is an attempt to create something spooky. I am not particularly fond of scary things because I am easily frightened. 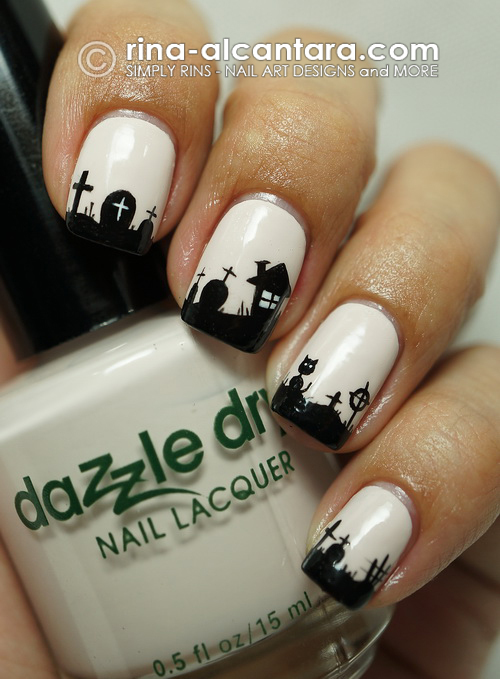 But I decided to paint a graveyard scene on my nails to achieve that spookiness. I suppose I can handle something like this on my nails. The idea is to use a very light background color instead of a darker hue, which is probably the usual choice to depict a cemetery. I figured that painting the graveyard with a dark base would be harder. Dazzle Dry Misty Moon was my choice of base color. It's a beige creme polish which I thought was perfect for this nail art since I didn't want to use white as background. This gave a subtle feel to the overall design. Consistency was slightly thick but very manageable during application. I used 2 coats for full coverage. I hand painted the design using acrylic paints, a detailing and stripper nail art brush. I am not so happy how I polished my nails here. It was too off from the cuticle area. Sorry about that. Anyway, this Halloween nail design is relatively easy to do. Just create irregular black tips and paint various images that you can find in a graveyard. I painted tablets, black cats, haunted house, and an owl. I only used black and white paints to get that shadow effect and to keep the design simple. It is always a challenge (for me, at least) to paint small shapes on nails. But I really wanted to get as much details into the design as much as I can. The stripper brush has become my best friend to create this nail art. Sometimes, tiny details can make a huge difference on the overall impact of a nail design. For example, I think adding the fine vertical lines on the tips to connote grass made the nail art more interesting. Showing off that owl on my thumb! If your design will use the nail tips, make sure to seal the bottom with polish. For this particular design, I used a black polish (Dazzle Dry Midnight Express) to cover the nail tips. Acrylic paint will chip easily even with a top coat. Nail polish is more chip resistant. From a distance, this Halloween nail art will look like simple black french manicure. This is actually what I love about it because the closer one gets, the more interesting the nails appear. I love the subtlety of this and it really looks fun. Hold on, did I say fun? So, does this mean this is NOT spooky? Hopefully, you like this one I came up with for Halloween. I still have a few more ideas that would like to share with you before the month ends. Are you spooked by my Graveyard nail art design? It's so tiny and cute <3 So many details, love the cat and the owl! Wow, it's just perfect ! this is ... adorable ! OMG this is beautiful and so sophisticated. You do lovely work. Wow Rins! Those are amazing! They look like decals! Mad skills lady! Nice work! I find it original and elegant! Love it! This looks so great, you did an awesome job! So much detail! Hi! This wonderful nail art design served as an inspiration for my Tombstone Nails. Hihi. Thank you so much for your awesome creativity. I've linked back to you in my post so that they can see it too.